Is there anything to see in Oban, Scotland? Is it worth a day or two on your precious Scottish itinerary? We have a soft spot for the place, this ferry gateway to the romance of the far-flung Hebrides with their... oh, stop, stop. I’ve just started writing this and been caught in the almost unavoidable snare for every Scottish tourism copywriter there ever was. Oban - gateway to what exactly? In any case, the town of Oban itself isn’t like that. It isn’t romantic and quaint. Actually, if you’re visiting from a major city, it probably is a little quaint. (It’s a relative term!) But it’s busy in the main season, like, say, the town of Callander - another visitor place (possibly en route to Oban) that is always bustling, though Oban has far more seagulls. Inbound ferry (centre), and island of Mull peeping up beyond nearer little island of Kerrera - a typical Oban bay view. (Pictured here) It's high summer, the sun is shining and the Argyll seaboard is looking its best. Lean on the Oban promenade railing and take this picture. Oban can be dreich. This is also a picture taken in summer. But it will clear up eventually. (Pictured here.) It's a bit dreich today in Oban. Is it classic Scotch mist? No, it's really raining. And it's still August. This is the small price you sometimes have pay for the lush greens and softness of the Argyll seaboard. I shouldn't have taken this picture. But I did. Anyway, I bet it brightened by the afternoon. Especially if the wind was from the sou'-west. Be warned. On a clear day, all it takes is that view from the Oban promenade of a black-and-white Cal-Mac ferry nosing out and setting course for the Sound of Mull, past the Lismore lighthouse. But (I predict) that’s what you’ll think as you stand in the bustle of the main street (George Street) as it reaches the promenade. That’s the trouble, you see, with all towns that are associated with the word ‘gateway’. Oban may be a destination, but it’s really a starting point as well. Oban - the sea-front - right at the end of August, so just past peak season. Still, at least the sun's out again. The Charing Cross of the Highlands. What? I note it described as this in a 1920 Ward Lock Guide, though there will be earlier references. Anyway, it’s a reminder of the network of old steamer services that once served the western seaboard, and now exist in pared-down form in CalMac’s ro-ro vital lifeline ferry links to the islands. Oban definitely does not smell - please be assured. I think this may be a reference to an earlier controversy to do with the arrival of the railway to Oban - hitherto a small settlement with a well-established distillery. Let me take you off on a tangent - but at least one that will let you understand why Oban looks the way it does. Though it was linked to the outside world (or Glasgow, to be accurate) through its steamer services, Oban as a resort was made by the railway, which opened in 1880. Vested land-owning interests decreed the railway could not reach the town along the coast on easy gradients and arrive, like today’s main road, from the north-west. Instead the track was diverted up and over Glen Cruiten (at extra expense to its builders) to arrive at the port of Oban on the south side of the bay. That’s how it is today. View from McCaig's Tower. Railway station to the left, North Pier to the far right. Main ferry terminal (with no ferry in port): white building with red/yellow logo immediately right of station. Note also Oban Distillery chimney, centre foreground. 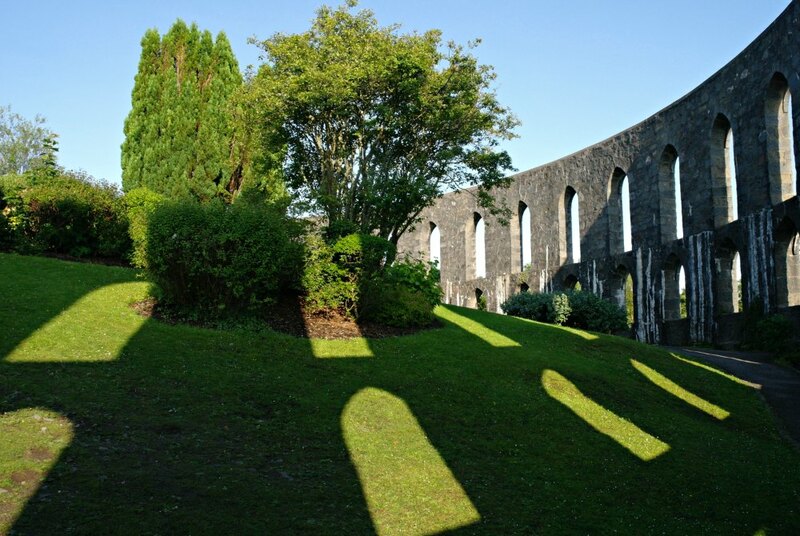 (Pictured here) Most everyone goes up the prominent landmark of McCaig's Tower and gets this kind of picture. This is looking south to the 'railway end' of the town. The island of Kerrera is top right, further out, sheltering the bay. The original intention was to have the main station at the south end and a kind of extension tramway to the pier running round the curve of the bay on an embankment that would effectively seal off sea views. Many of the locals were indignant at the intrusion - and controversy raged. The ‘preserve our sea views’ faction were incensed at the prospect of rails running through the streets. On the other side, the ‘embankment’ supporters argued that Oban Bay was so smelly and unpleasant that it would be service to the community if it was separated from the town by a raised tramway to the North Pier. (That’s how it was ’way back then. From McCaig's Tower. North end of town, with road to Ganavan Sands running round by the church tower, upper right. Tip of island of Kerrera upper left. Anyway, the sea views were preserved, the railway embankment was never built, the rails stopping instead on some reclaimed ground on the south side of the bay. The railway folk even built their own pier adjacent to the station. Today, steamers (or rather, roll-on, roll-off ferries) meet the trains via the interface of a fine modern CalMac booking office and waiting room with the ambience of a small but salty airport terminal. The North Pier has a seafod restaurant ‘Ee-usk’ (with a sound reputation, we hear) instead of the bustle of loading and unloading of steamers. By the way, back then, who owned this North Pier and was understandably keen on seeing railhead and steamers brought close together? Well, that was none other than famous local banker and town benefactor, John McCaig. He was later to fund the most famous edifice in Oban today, the horizon-dominating, unfinished replica of the Parthenon in Rome, known as McCaig’s Tower. Personally, I have never understood why it is called this, as it doesn’t look like a tower to me. However, it’s a kinder name than McCaig’s Folly, by which it is also known. 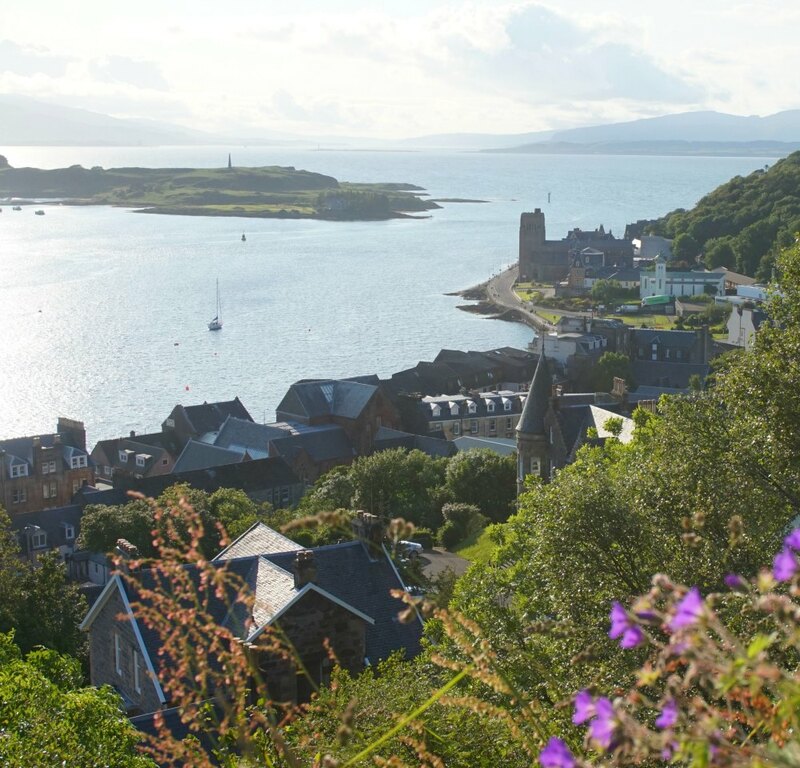 Great views - an Oban must-see, in fact. Oban - and there's a sale in a shoeshop, a distillery behind and McCaig's Tower on the skyline. Well, that's a good way of spending at least part of the day when the sky is grey. (Pictured here.) This time it's a grey morning in the gateway town of Oban. It's sure to get brighter later. But in the meantime, you could stroll around the shops, walk along to the local musuem, or do a distillery tour - it's just seconds from the seafront, though right now, I'd give McCaig's Tower a miss - the view from up there will improve later. What else to see in Oban, as well as that McCaig's Tower? There are other heritage places as well, such as Dunollie Museum, with its (ruined) castle and grounds, also on the way out to Ganavan. Oban is pretty good for shopping as well - it services the island communities, so there's a big Tesco - but is good for quality souvenirs and the sort of things visitors like. Add in the choice of restaurants and it should be seriously considered for inclusion in your itinerary. The local tourism association website naturally waxes lyrical - and probably has much to wax lyrical about. It also describes Oban as the Seafood Capital of Scotland - a good reminder of the number of places to eat, from seafood stalls to upmarket restaurants. 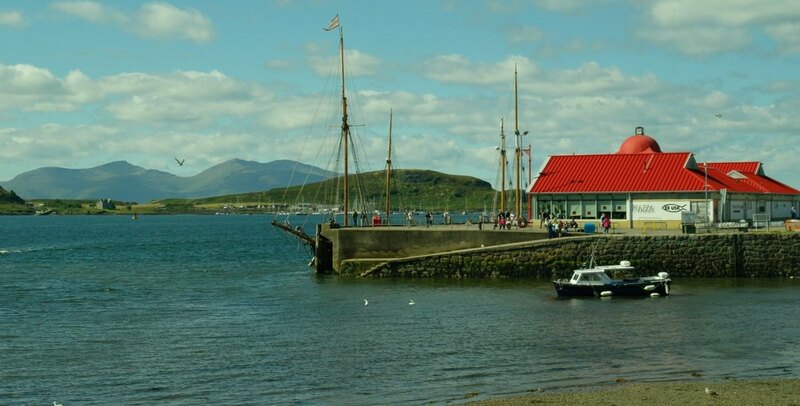 At the very least Oban plus the island of Mull is a great experience of Scotland’s western seaboard - and the restaurant choice in Tobermory on the island matches anywhere you’ll find in Oban. And whisper it, just between ourselves - Oban can look pretty busy sometimes, but we have never found Mull as totally chocka as, say, the Isle of Skye. Know what I’m saying? 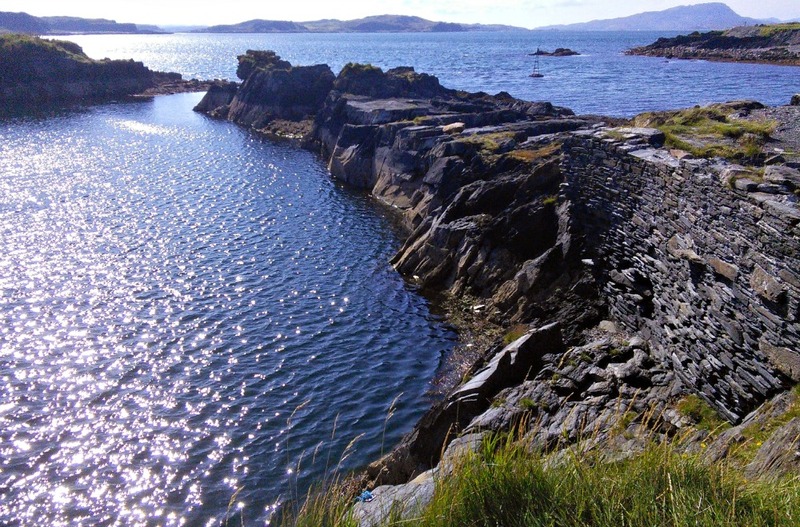 A few minutes south of Oban is the site of a former slate quarry. I agree, it doesn’t sound over-attractive at first - but it’s on the Island of Seil that you reach over a narrow hump-backed bridge popularly referred to as the ‘Bridge over the Atlantic’ because it spans the arm of the sea that separates Seil from the mainalnd. The slate quarries by the sea were worked for well over a century until the main one was overwhelmed by a storm in 1881 - as this deep pit was only separated from the sea by a narrow wall of rock. The former quarrymen’s cottages in their neat lines are now even neater and whitewashed and form the village of Ellenabeich. There is a museum telling the story. Just offshore is Easdale Island - and sometimes the whole area is called Easdale. You can whizz off to see the Corryvreckan Whirlpool on a rib trip courtesy of Seafari Adventures from here as well. (They also have a choice of other trips.) There is a pub as well as the museum, plus a souvenir shop and an attractive little garden (An Cala). 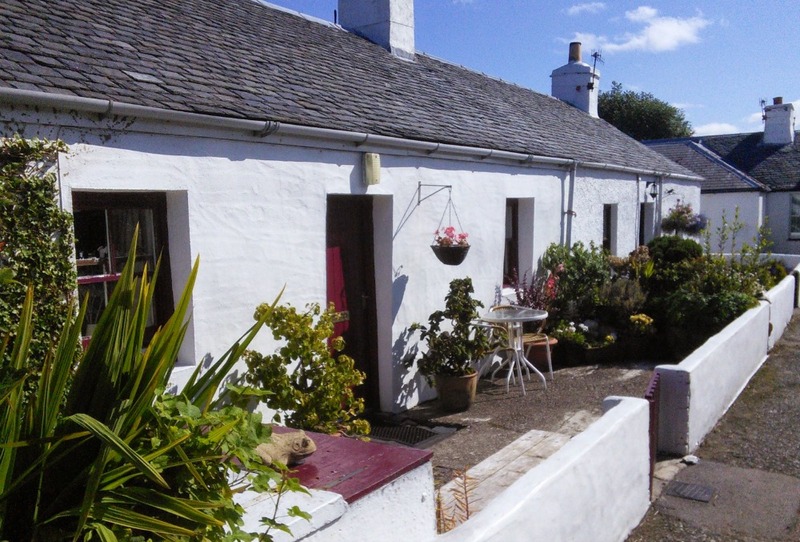 Is the Isle of Seil worth the excursion? Yes, but don’t treat it as a real Scottish island experience - though it’s a good way of experiencing the soft ambience of the Argyll seaboard.